I know you guys think that I have fallen off the face of the earth because I have been frantically decorating this new house and getting it blog-ready to take you all on the Grand Tour soon. In reality, I’ve been laying on my couch watching marathons of Fixer Upper and rubbing my growing belly. I am 22 weeks pregnant today, and we are in our sixth week of getting used to waking up in this new house. I was a hermit last time I was pregnant, and I am a hermit this time as well. It’s just how I work, apparently. I sincerely apologize for leaving everyone hanging on new house pics. I make you a promise that I will get a full tour up eventually. Notice I didn’t say soon. So far the only things we’ve done around here are change out all the toilets (y’all didn’t really want to see that documented, did you?) and have the floors refinished before we moved in. We’ve also been up to our eyeballs in moving boxes but those piles are slowly getting whittled down. Pretty big transformation, right? I think so! I had Lowes come out and measure/ install the blinds for me, so this is not a DIY post OR a sponsored post, just a regular old decorating idea post. I LOVE having the top half of the windows open so I can see the trees outside in my backyard. They let in so much more light now, which might be an issue in the summer if we have to wear sunscreen to eat dinner at the table. Or if they start fading my placemats. HA! But I will deal with that as it comes. 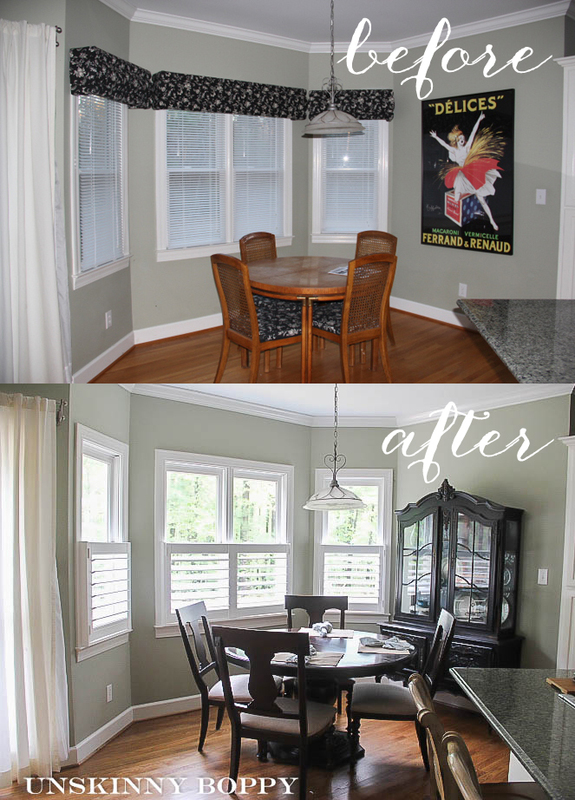 Although I love the way these shutters transformed this space, I do have one regret. Here is what I wish I had done differently. See how they are just a few inches below center of the window? I wish they were about 2-4” higher so that the tops of them hit the window right at the center line. They look a little bit squatty to me. Can you see the height difference? But, it’s done now, and I really do like the way they turned out! But take notes, guys! If you ever decide to do this in your own windows be sure to think that part through better than me and get those blinds centered up so they are not lil shorties on your windows. Lesson learned! I’m definitely digging this look way more than the aluminum blind/ valance combo. There is still lots left on my to do list but it’s coming together piece by piece. 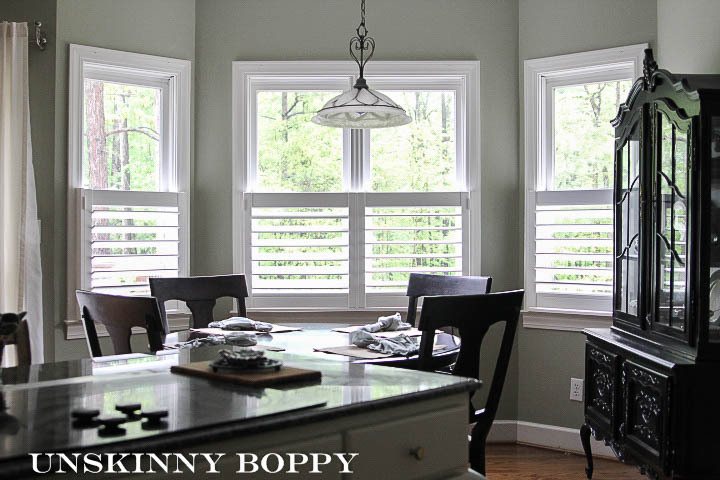 For those who asked on facebook: These are 3” Sonesta brand plantation shutters from Lowes. I liked the fact that they don’t have that center bar to open and close them. They are not real wood- they are actually plastic, which cut down a little bit on the price. Still way more expensive than most blinds, but totally worth it if you want an instant designer look in your home! I’ll try to be back with more new house pics soon. Thanks for being patient with me while I bake this baby. « Dreaming of Remodeling? Come to BREXPO! Looking good! I, too, would like half shutters. Penneys has them, along with the narrower louvered old school ones! I think that a Penneys rep will come to your house with samples + to measure, etc. I bet they would. Thanks for that tip! I just push on the bottom or top of a single slat and they open. The bar is hidden on the backside. i love this look Beth, so pretty! I’ve been thinking about getting these for the whole house but they are expensive. Great job! I think the plantation shutters look great. Once you have some things on the walls I believe it won’t look so squatty as you say. I’m glad your putting you, baby and family first. Take care. When I got my Plantation Shutters 12 years ago to block out the Florida sun the guy who measured and sold them steered me away from wood. He said it would eventually warp. I have never regretted the “fake wood”. They still look great! Looks good! thanks for the good tips about the blinds. I like the openness of the room without curtains. I agree, I like looking out and seeing my yard and trees. It is great to hear from you and to get a peek at your “new” home. I really like what you have done so far! Keep up the great work (both on the home and the baby baking)! Take care! Hi Beth, I love plantation shutters! I have Lowes scheduled to come measure later this month! I’m so excited!! My husband said I would buy a house just because it has plantation shutters! Ha! I think he’s right! I hope you enjoy your shutters and I can’t wait to get mind! Take care of yourself and I am looking forward to the home tour! I don’t think they look squatty at all. If they were higher I think they would look too big for the window. Your windows in the old house were taller and had grids, totally different look. I look forward to your future pictures. I am new here, came from Rhoda’s blog. Totally agree. In fact, the shutters in this new house look to me like the ARE half way up. It’s just the different shape of the windows compared to the old house, I think. Beth, so happy to know I’m not the only one that goes in to hermit mode when pregnant! Congrats to you and Jeremy! Can’t wait to see the pics of the new house. The shutters look great! You’re so talented! Looking forward to seeing your work on the nursery. Take care! Thanks so much Jeannie! Hope you’re feeling great! I’m good except for that whole zero motivation thing. I just found your blog through Pinterest. I love the pottery barn vanity that helped inspire your old master bath. Then I took your home tour, loved your old home! Decided to scope your blog and of course the first post I see is that you have moved! LOL!!! I wonder how far I will have to dig on your blog to see why you moved from your lovely old home. Congrats on your pregnancy! These look beautiful in your home. 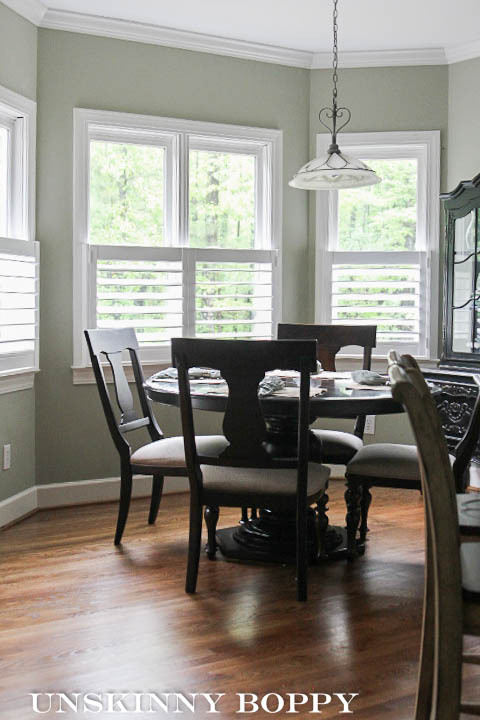 Plantation shutters add that unique look to any room. Thanks for sharing! Everything looks really nice, love it, Btw what’s the color that you have on the walls??? 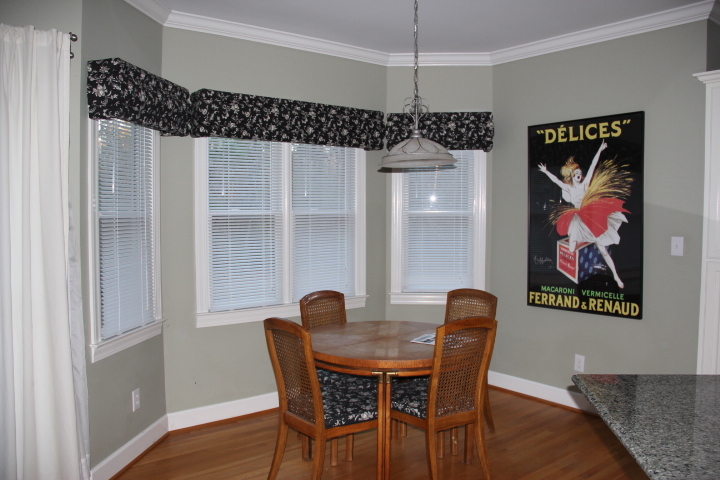 I love the blinds, but I would also like to know what the paint color is on your walls! Thanks! Hey thanks! 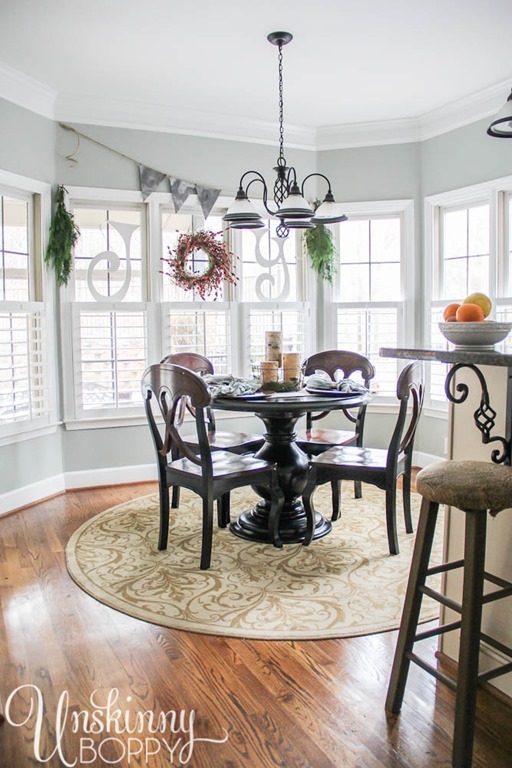 The paint color came with the house– it’s a kind of grey/green color called Plaza Suite from Sherwin Williams. Unfortunately it’s a discontinued color and I cannot find a color match for it anywhere. It’s very similar to SW Clary Sage but a little greyer. Looks great, what colour gray is that on the walls?? problem visually. 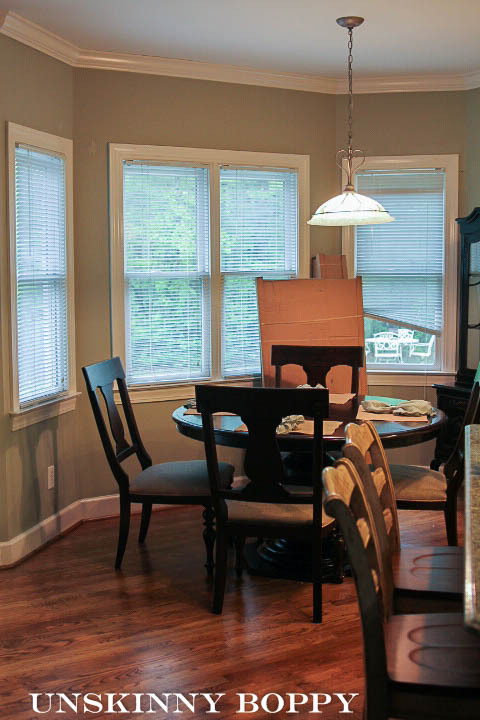 When the roman blinds were pulled up, they were barely noticeable. Easy to make and under $100 for all six. 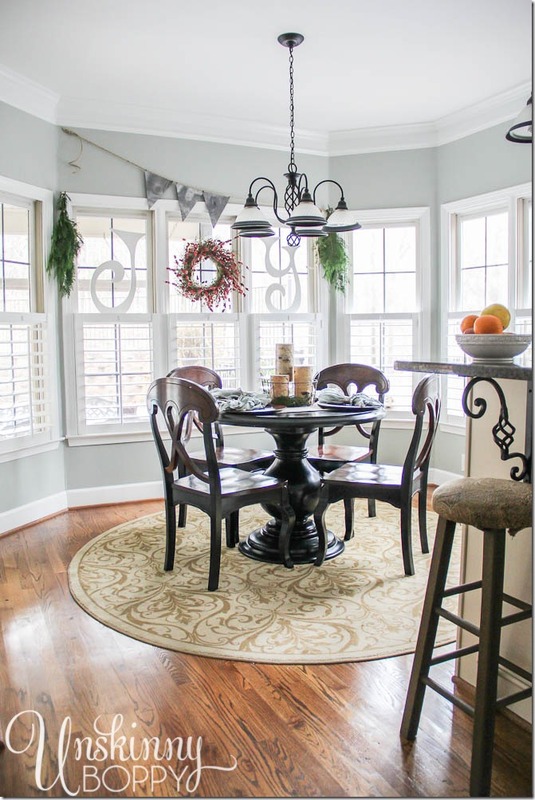 Those plantation shutters are beautiful! They really add a whole new style to your home. They look a lot more modern and classy. That was definitely a good investment. Your blinds look great. I really love your flooring. Can you give me information on them? Thanks for sharing Unskinny Boppy. Our readers love our tips and this will only help them achieve a greater level likely step in a bit more with us. Basics of taking care of the customer/reader always are in line. I like the look of the half shutters but I prefer to have the full length with a divider rail so I can close the bottom louvers and keep the top open to allow in light. What a nice article! Thank you for sharing this!